When I was young, my sister would always complete puzzles. It made me so mad because I knew I didn’t have the patience or attention span to complete one, but there’s a part of me that’s always wanted to say I had. 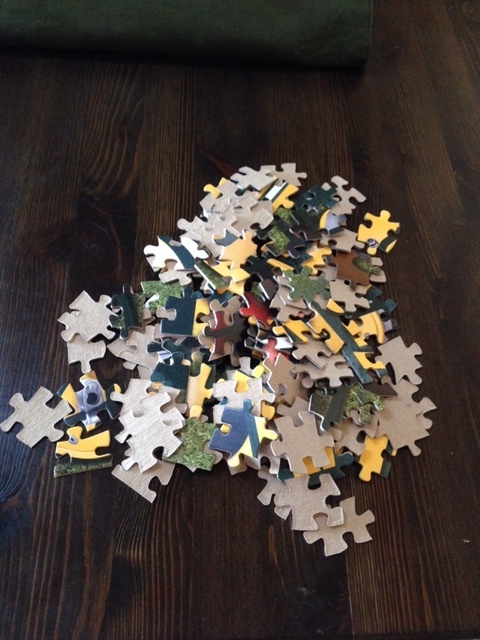 Some say that completing a puzzle makes your brain work harder and challenges parts of it that are seldom used. For 33 years, I would have needed a locksmith to unlock that unused part of my brain because it was locked down so tightly, but not anymore! The first thing I had to do was find a puzzle I could complete. That meant I needed a small puzzle (no 500-piece puzzle, thank you very much) and the puzzle’s picture was the second most important thing to me. I wanted to actually enjoy the end result. 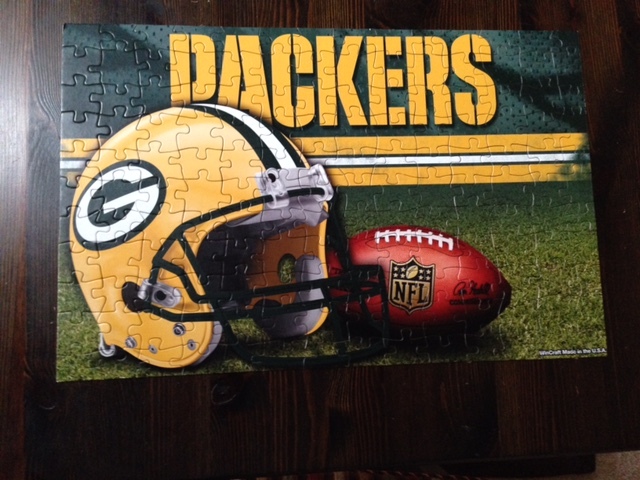 So, it should come as no surprise that I bought a Green Bay Packers puzzle. It was perfect. In addition to the image, it was just large enough for me to feel like I accomplished something: 150 pieces. I know that’s a small puzzle to most, but bear with me. In an effort to feel like I was solving a mystery, the first thing I did was place the pieces everywhere on our living room table. After I sized up the puzzle, I sat down and started to work on it, but not without an unexpected challenge — a challenge I did not see coming. This challenge’s name was Lyssa. She wouldn’t leave the puzzle alone. Every night she would walk by and put a few pieces together to rub it in my face that assembling puzzles comes easier to her. Words can’t describe how frustrating it was. I didn’t want to finish it in one sitting, so I worked on the puzzle for a lit bit every day or so. It was a nice, leisurely project. After two weeks, I finally completed it. Two weeks is pretty slow, but I enjoyed my time with it. As far as completing more? Nope. One 150-piece puzzle is enough for me.